$$$ KPO and CZM $$$: DBS Multiplier + SSBs + Joint Account = Higher Interest! I've been buying SSB over the last 2 years as a form or retirement handout for my parents when they retire. Since the opening of my multiplier late 2017, I've been fulfilling 2 categories with my SSB interest and credit card spending. I'm currently outstation but I still uses my credit card for a 0.50eur per month. I can verify that I'm still getting an interest rate of more than 2% every month. Thank you for the confirmation! Looking at the FAQ, we are both pretty sure it will work too. Hahaha. Welcome! Need to find alternative to recoup Thaibev losses. Hahaha. You can use this strategy with your mum for higher interest! Hi. Nice tip. The SSB should be credited into joint account or multiplier? Thanks. So just need 1 CDP account? Time to sign up for next bond exercise. Yeah. Technically both CDP also works but consolidate to 1 account easier. Take note of the dates if you are applying for May SSB! The minimum balance for a joint account is $3000 instead of $500. The dbs person said that's the only one that they are offering now. Unfortunately, not everyone is proficient/familiar with the products the bank is offering. Can i just check with you which credit card are you using in tangent with this strategy? Most of the credit cards have an annual fee of 192 per annum. Possible to waive annual fee based on your spending? Any DBS credit card will do! It depends on whether you belong to the cashback camp or the miles camp. lol. Yes. So far, I only paid for annual fee that give miles/points in return. The annual fee for my other credit cards are always waived. Hello, just curious how can fresh graduate who just started working take advantage of the DBS multiplier interest rate? Don't think they can't apply for a credit card yet. Or is there other account more suitable for them? Once you receive your first month payslip, you will be able to apply for a credit card. That was what I did :) My first account was OCBC360 when I graduated and that account requires credit card spending too. Hi! 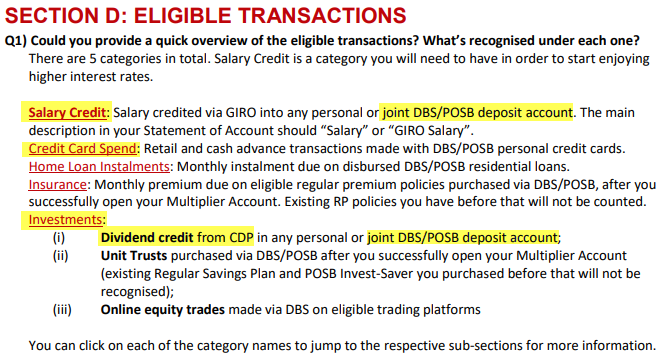 Do you mean the salary does not have to be credited to the Multiplier account itself but just any other POSB/DBS account? Also, the minimum spending on credit card - will that work on debit cards? Or do I have to get a credit card no matter what? If it works on Debit card, do I have to link my card to my multiplier account? 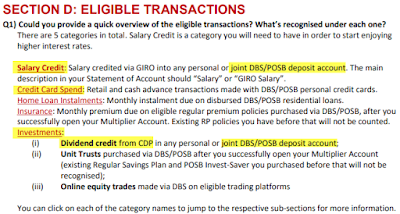 Salary credited via GIRO into any personal or joint DBS/POSB deposit account. The main description in your Statement of Account should “Salary” or “GIRO Salary”. Unfortunately, it has to be a DBS/POSB credit card with you as the principal card holder. Nice article. Especially on the bond ladder using ssb! Thank you! Sounds like you are holding on to lots of cash, hence the need to have multiple savings accounts. What an excellent problem. Hahahaha. I am new here. Love reading all your blog post. I just started to open a DBS Mulitpiter Account and using the relevant DBS Credit Card. So far I think I am getting 1.85% interest which is around $50-60 per month. Can I just check do you all use $500 every month to buy SSB so that it is counted as one of the components to get more interest? Thank you!! Glad that you are enjoying the blog! The month when you buy SSB, there will be NO additional interest because buying/applying for SSB is not counted as a category. 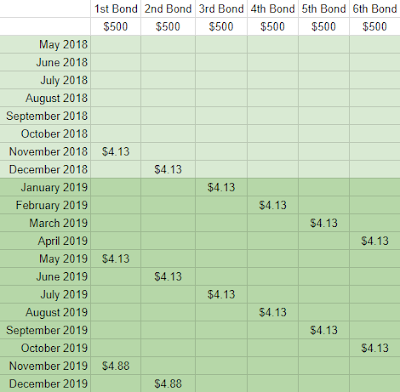 However, 6 months later, when SSB gives dividend/coupon/interest and you have enabled dividend crediting from CDP to the joint account or multiplier account, you will be getting additional interest because dividend crediting from CDP is considered under the "Investment" category. So We are not buying every month! Only on months where we do not have stocks paying dividends. 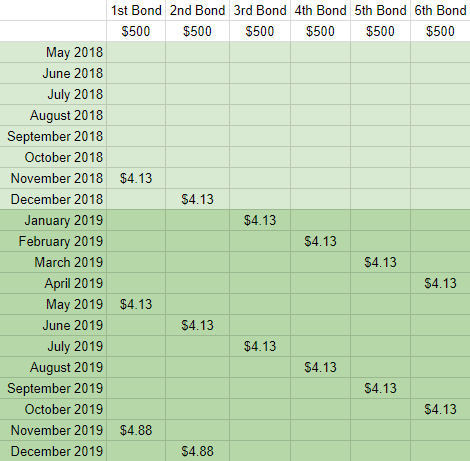 If you do not own any stocks, the easiest way is to buy $500 SSB consecutively for the next 6 months and collect higher interest until DBS changes the T&Cs for the Multiplier account. Hi KPO, thanks for sharing this tip and patiently answer so many questions. This specific one was exactly what I was looking for. Now, I understand the 6-month wait before the SSB Ladder starts to payout to the Multiplier account. Meanwhile, for this 6-month gap, what is the simplest strategy that can immediately satisfy a missing category. My situation is that I was using a RSP (regular saving plan) but that only work for 12 months, and it has just expired. Thanks in advance for sharing your knowledge! One thing to clarify and need your advice. Do both joint account holder in multiplier eligible for one of the category benefit, if one have a DBS/POSB credit card? For the credit card category, each of you need to have your own DBS/POSB credit card as the principal card holder. In addition, you will need to spend using both cards for the month to qualify (there is no minimum spend so $1 also works).